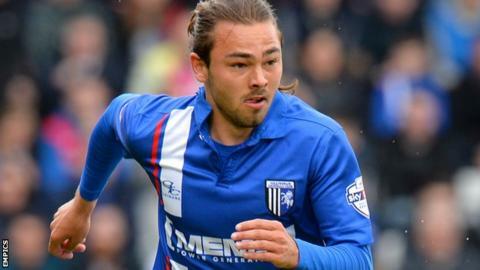 Gillingham extended their unbeaten home record in League One this season with a tight victory over Rochdale. The hosts took the lead when Bradley Dack tucked home his 10th of the season from six yards, latching onto a ball from Dominic Samuel. Dale's Callum Camps and Donal McDermott both forced Gills keeper Stuart Nelson into smart saves in response. James Hooper had an effort turned onto the crossbar as Dale pressed but Deji Oshilaja secured Gills' win late on. Justin Edinburgh's side had lost two of their previous three games in the league but victory takes them to within a point of leaders Coventry. Rochdale created chances throughout the game but the defeat means they have won just once in their last nine league outings and sit 14th. Match ends, Gillingham 2, Rochdale 0. Second Half ends, Gillingham 2, Rochdale 0. Corner, Gillingham. Conceded by Rhys Bennett. Oliver Lancashire (Rochdale) is shown the yellow card for a bad foul. Corner, Rochdale. Conceded by Bradley Garmston. Rory Donnelly (Gillingham) wins a free kick on the right wing. Attempt missed. Callum Camps (Rochdale) left footed shot from outside the box is too high. Corner, Rochdale. Conceded by Bradley Dack. Goal! Gillingham 2, Rochdale 0. Adedeji Oshilaja (Gillingham) header from very close range to the centre of the goal. Corner, Gillingham. Conceded by Michael Rose. Attempt saved. Bradley Dack (Gillingham) right footed shot from outside the box is saved in the centre of the goal. Attempt missed. Calvin Andrew (Rochdale) header from the centre of the box is close, but misses to the right following a corner. Attempt saved. James Hooper (Rochdale) right footed shot from outside the box is saved in the bottom left corner. Substitution, Gillingham. Doug Loft replaces Aaron Morris. Attempt missed. Michael Rose (Rochdale) left footed shot from outside the box is close, but misses to the left from a direct free kick. Attempt saved. Calvin Andrew (Rochdale) left footed shot from outside the box is saved in the centre of the goal. Substitution, Rochdale. Michael Rose replaces Tom Kennedy. Substitution, Gillingham. Brennan Dickenson replaces Emmanuel Osadebe. Substitution, Rochdale. James Hooper replaces Donal McDermott. Attempt missed. Tom Kennedy (Rochdale) left footed shot from the left side of the box is high and wide to the left.